A senior runner takes part in the 2016 Rock ‘n’ Roll Dublin Half Marathon. Just as some things in life get easier with age, inevitably, there are other things that get harder. Important things, like regenerating bone density. It's not exactly the hottest new trend for looking and feeling young and healthy in our 50s, but it should be. For many women, finding ways to regenerate bone density throughout our 20s and into our later years isn't always intuitive or even something we think much about. That's when running, even into the postmenopause years, and other high-impact and weight-bearing forms of exercise can be crucial, says Ranit Mishori, a professor of family medicine at Georgetown University's School of Medicine. Although women aren't considered to be in menopause until they've gone 12 months without a period, according to the National Institute on Aging, most women begin the transition to menopause between the ages of 45 and 55, and the process can last seven to 14 years. That's because a key factor in menopause is the gradual decrease in some hormone levels, especially estrogen, Mishori says. This decrease in hormone levels begins as a woman approaches the end of her childbearing years, typically in her 40s. Estrogen levels can drop so slowly that many women, distracted and busy with children at home and active in their careers, might not notice the changes until menopause or even postmenopause when symptoms such as hot flashes, weight gain and insomnia become most prominent. Although these are the symptoms that the media might focus on, it's the bone loss that can be the most devastating, causing bones to become brittle and fragile, including weight-bearing bones such as the hip and spine, Mishori says. We tend to think of our bones as, well, ossified, but they are living tissues that are constantly changing and growing, turning over cells, laying down new bone and removing old bone as part of the physiological process. By postmenopause, the balance shifts such that we remove old bone more quickly than we make new bone, leading to an overall reduction in body bone mass over time. If you can visualize how strengthening your muscles makes them bigger, you'll have a better understanding of how our bones can become stronger and denser if we put stress on them. Our bodies build bone mass when we apply stress along the full length of our bones, which is what happens when we run, saod sports medicine specialist and physical therapist Kevin McGuinness of Washington Orthopaedics & Sports Medicine. Bones build structure in response to the stresses applied to them, and for the weight-bearing bones, such as those in our legs and hips, you need to apply stresses while upright, working against gravity, in a weight-bearing fashion, he explained. "The greater the stress, the greater the bone-building response," he said. Because postmenopausal women lose bone density more quickly than similarly aged men, they are at greater risk of hip fractures, McGuinness said. Hip fractures in an older woman can cause complications that can hamper independence and lead to other issues, including respiratory and circulatory problems as a result of becoming more bed-bound. "For women, it is very important to build a base of strength and bone density in your 20s and 30s, because it becomes much harder to generate new bone in your 40s, 50s and 60s," McGuinness said. "Not that it's impossible to build it later in life, it's just more difficult." In addition to rebuilding bone density, running is also excellent for helping women address some of the other effects of menopause, said Mishori, 51, a runner and former triathlete. Running can reduce hot flashes, improve sleep and cardiovascular function, alleviate pain and discomfort associated with arthritic joints, and even help with cognition and depression, Mishori said. "I absolutely urge women who run to continue running after menopause," Mishori said. "And there's no reason to not start running in your 50s." Mishori tells her patients that they can start small, working their way up to one mile, then twoand maybe even up to a 5K. 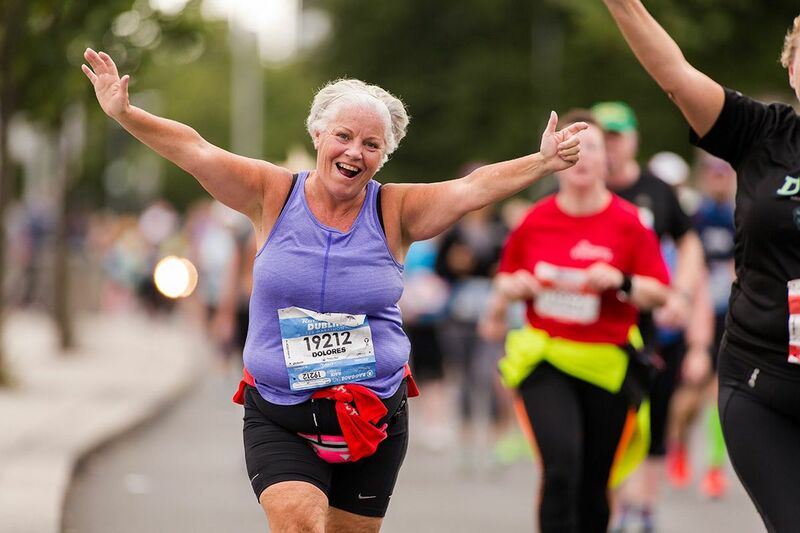 "I know women who started in their 50s and 60s and are running half-marathons," she said. If running isn't an option, McGuinness suggests resistance training (with or without weights) and yoga, which can build bone density as well as help maintain strength and motor control. If you've been a runner since your 20s or 30s, Mishori said, you're going to notice differences postmenopause. For example, the body becomes less adaptive at digesting sugars, breaking down carbohydrates and regulating its temperature, Mishori said. This might mean that postmenopausal women consider fueling longer runs with fruit, such as a banana or dates, or using just half or even a quarter of a sport energy gel. And Mishori recommends bringing a frozen headband on your runs so that as it thaws it slowly releases cold water onto your hair and shirt. And bring light layers, she added. Aging runners, whether experienced or not, don't recover as quickly as they once did, said Claire Bartholic, a five-time Boston Marathon qualifier, competitive masters athlete, and coach at Runners Connect, an online community of runners and coaches. "If you raced on a Saturday in your younger years, you might have been able to do some speed work a few days later and have no problems," she said. "Now we need to take our time and get back to some slower running, easier recovery running, to feel good again." Another effect of lower estrogen levels is that the body wants to store more fat just as it's losing muscle, and fat slows you down, Bartholic said. This is important whether or not you're a competitive runner if you enjoy participating in certain organized races, including the Marine Corps Marathon, which specifies that all runners maintain a 14-minute-per-mile pace across the course. "You'd rather have lean muscle on board to keep you moving faster," said Bartholic, who recommends regular strength-training sessions to all of her runners but especially to her postmenopausal runners. Carolee Belkin Walker is a wellness blogger and the author of "This Is My Brain on Endorphins: How I Got Fit, Healthier, And Happier (And You Can, Too)," out in February 2018.